News > Events > The April issue of IE is out! The April issue of IE is out! Food is such an important issue with growing children. Getting the balance right between nutrition, fun and innovation is really one of the most difficult tasks a school has. Not to mention all of the different food requirements these days. 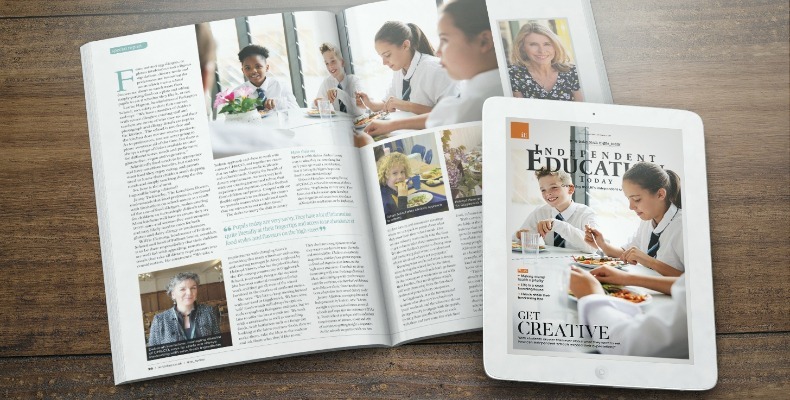 On page 25, Natalie Trice discusses the challenge of school dinners in the modern age, drawing advice from headteachers as well as independent school caterers themselves, to help you in your quest for nutritional nirvana. Speaking of hot topics, this month I have been asking independent schools what they are doing to encourage positive mental health in students. Even writing this feature was a rewarding experience, finding out all the inventive ideas schools have had to get the message out about looking after yourself, and others. For example, children at Knightsbridge School turned into kindness detectives for Children’s Mental Health Week, where each child was given the mission of doing something kind for another pupil. It’s a lovely story with a really strong message about how even something small can make a big difference. Read more on page 33. In this issue, we also interviewed Bernard Canetti, principal of Brampton College. The independent sixth form college was revealed as London’s highest achieving sixth form college for the 18th year running. Want to know the secrets to their success? Turn to page 62 for his advice. The May issue of IE is out! The Summer issue of ISS is out now! The March issue of IE is out! The latest issue of Independent Education Today is out now! Have you read the latest issue of Independent School Sport? The Money Issue: read the latest IE Today magazine now!